One of the problems many older job seekers have, and those without continual employment time lines, is the inclusion of dates of employment within both their Professional CV and Job Application. My answer to solving any CV Writing Problem is always to look at the problem from the employers view point. That way you can see what needs to be there, and figure out how to fill the resultant communication gap. We have covered overcoming lack of experience in another post, so in this one we will concentrate on the ageism issue. Firstly, yes, there is age-based discrimination, but it is not as prevalent as you may think/conclude. The employers issue always comes down to first to relevancy of skills (Technical Fit). The problem, and if there is any discrimination, is at the next stage within the Social Fit criteria, and its a question of whether you the job seeker will adapt to a new environment? Answer that, showing willingness to adapt to new cultures, systems, technologies and particularly team environments, and that will no longer be a problem in your job search. By following this plan, you resultantly focus of your Professional CV on the most relevant information, ie: that gained in the last five/seven years. Beyond that, as long as there is a consistent time line, then don’t worry. 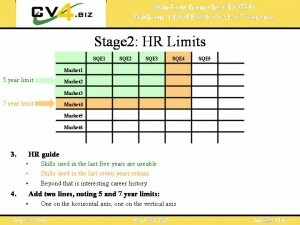 HR people will focus on the last 5-7 years of experience, ie: what you did and achieved. Anything beyond that is considered interesting career history, but effectively for most outside the academic/medical/legal world as career history. Hence, why focus on it, let alone include it, if its not assessed? A concistent and continual timeline is an essential key of converting Job Applications into Telephone Interviews (other wise the employer thinks “what are they hiding”), but you don’t need to list everything from your last day of school.